Genesis Starflight (USA,r0) in 02:52.45 by Aqfaq. Starflight puts the player into the captains seat and sets them free on a galaxy of 270 stars and 800 planets. 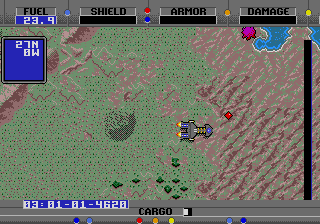 This is an early example of a sand box game which leaves the player free to explore for minerals, locate habitable planets, upgrade the ship and crew, and interact with aliens. The eventual goal becomes stopping unusual solar flares in the region. In this run the clairvoyant space pilot already knows the cause of the flares and gets straight to business. He buys a better engine and pumps a ton of fuel into his ship called "A". The initial resources are barely enough to reach the key destinations. The pilot hero and his multi-talented single crew member sidekick also called "A" work together to obtain the Black Egg and the Crystal Orb as quickly as possible. All is done with a minimalistic route. All pieces seem to fit together seamlessly. The ship called "A" reaches the Crystal Planet with only a drop of fuel left, so it is a bit strange that the heroes manage to escape the effects of the Star Wars-esque planet-scale explosion. Most of all, this is a lesson in ecological driving as the fuel would have ran out, if the final destination had been even a few pixels further.